The first good-sized storm of this winter season has arrived. The rain started last night and continues this morning. The steady rain of course will cause localized flooding because Fernley has very little drainage to speak of. 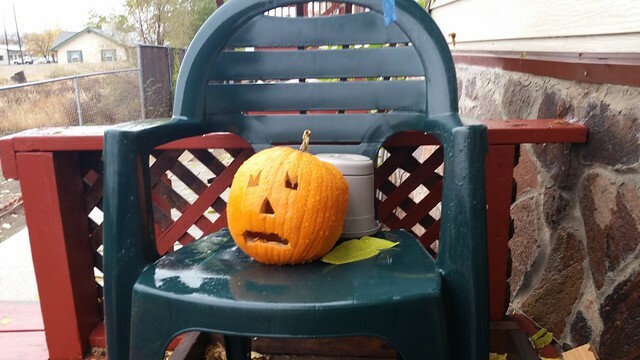 This year's Fernley House Jack-o-Lantern sits on the porch in the rain contemplating its fate, which is likely to involve trying to improve the projected flower bed if I can figure out how to grind up the pumpkin sufficiently to help the soil there. It's a good thing I didn't have to go to the Bay Area this past weekend. I would have had to leave on Saturday to skip the snow (and chain controls) over Donner. However, inasmuch as I do not have to be out in it, I say, "Bring it on!" as we need lots of snow and rain to refill the reservoirs and aquifers serving both California and Nevada.